2mm Darkest Essex Area Group: The Darkest Essex Area Group - Who are we? The Darkest Essex Area Group - Who are we? The DEAG is one of a number of area groups that exist as part of the 2mm Scale Association which encourages all aspects of modelling in a scale of 2mm = 1 foot. Whilst members of the Association are spread around the world, the majority are located in the UK. We model various prototypes from around the globe and the period’s modelled can (and do) vary widely. 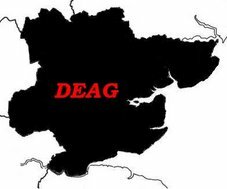 The current members of the DEAG model UK prototypes, GER, GWR, LNWR, LANKY and BR periods and are a group of like minded individuals who all belong to the same modelling association. We meet monthly all year round at the house of one of our member’s, when questions are asked / answered, problems are solved, modelling is done and world issues are resolved. We also consume vast quantities of cake, tea and coffee. Our meetings are informal modelling sessions although occasionally one or more group members, or an invited guest, discusses/demonstrates how they tackled a particular modelling project. We are planning to have one such session in the near future looking at DCC. Because we meet in a private house, membership of the 2mm Scale Association is generally a pre requisite of attendance although friends of members are welcome. Contact information can be found in the Association’s Yearbook. Further information about the 2mm Association can be found by clicking on the links on this page.